RESERVE ONLINE AND 1 CHILD UNDER 11 YEARS OF AGE PARTICIPATES FREE FOR EACH PAID ADULT. This promotion is only valid when booking one paying adult. Once your purchase is complete please contact us to register the child. Don't miss out! Enchanting kisses and wonderful experiences await you on the Dolphin Connection Vallarta Adventures Tour. Delightful Pacific bottlenose dolphins will meet you in a specially designed pool that allows for easy interaction with these remarkable creatures. 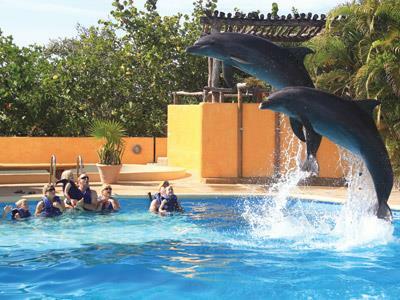 When you arrive at this Puerto Vallarta attraction, you’ll learn about their physiology and underwater communication skills before you venture into the water to spend time with the dolphins. Feel their smooth skin as they swim past you, learn how to feed them and pick up a few tips from the dolphin trainers. The 40 minute Dolphin Connection Tour operates daily, making it easy for you to take time out from your travels through Puerto Vallarta to meet these intelligent and friendly creatures for yourself.